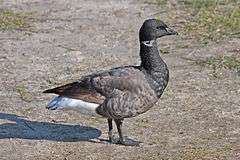 The brant, also known as the brent goose (Branta bernicla) is a species of goose of the genus Branta. 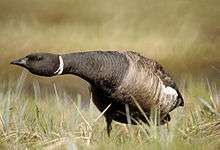 The black brant is an American subspecies. The Brent System, a major oilfield, was named after the species. The brant is a small goose with a short, stubby bill. It measures 55–66 cm (22–26 in) long, 106–121 cm (42–48 in) across the wings and weighs 0.88–2.2 kg (1.9–4.9 lb). The under-tail is pure white, and the tail black and very short (the shortest of any goose). Branta is a Latinised form of Old Norse brandgás, "burnt (black) goose) and bernicla is the medieval Latin name for the barnacle. The brant and the similar barnacle goose were previously considered one species, formerly believed to be the same creature as the crustacean. That myth can can be dated back to at least the 12th century. Gerald of Wales claimed to have seen these birds hanging down from pieces of timber, William Turner accepted the theory, and John Gerard claimed to have seen the birds emerging from their shells. The legend persisted until the end of the 18th century. In County Kerry, until relatively recently, Catholics could eat this bird on a Friday because it counted as fish. ↑ BirdLife International (2012). "Branta bernicla". IUCN Red List of Threatened Species. Version 2013.2. International Union for Conservation of Nature. Retrieved November 26, 2013. ↑ "UK Brent Oil". One Financial Markets. Retrieved 25 August 2014. ↑ "Brant". All About Birds. Cornell Lab of Ornithology. Retrieved 18 October 2011. ↑ "Brent Goose". Oiseaux-birds.com. Retrieved 18 October 2011. ↑ Book of North American Birds. 1990. ↑ Jobling, James A (2010). The Helm Dictionary of Scientific Bird Names. London: Christopher Helm. pp. 70, 77. ISBN 978-1-4081-2501-4. ↑ Cocker, Mark; Mabey, Richard (2005). Birds Britannica. London: Chatto & Windus. pp. 78–80. ISBN 0-7011-6907-9. Shields, Gerald F. (July 1990). "Analysis of mitochondrial DNA of Pacific Black Brant". The Auk. American Ornithologists' Union. 107 (3): 620–623. Syroechkovski, E.E. ; Zöckler, C.; Lappo, E. (December 1998). "Status of Brent Goose in northwestern Yakutia, East Siberia" (PDF). British Birds. British Birds Rarities Committee. 91 (12): 565–572. Ebels, E.B. (1997). "Identification of brent geese: a new feature" (PDF). Dutch Birding. Dutch Birding Association. 19 (5): 232–236 (highlights the difference in belly colour between the various forms). Wikimedia Commons has media related to Branta bernicla. "Brent Goose media". Internet Bird Collection.